From repairing a simple pothole in your parking lot to completely restoring the surface of your entire asphalt parking lot to fixing a damaged curb, Unlimited Professional Services is the one to call for asphalt concrete repairs. The parking lot to any office or store location is one of the more important aspects of a business location. People don’t like visiting a location that has a bad parking lot, such as one that is old, cracked or has a lot of potholes. You don’t want to lose business on account of your parking lot, that is for sure! Unlimited Professional Services has been servicing the Raleigh area for years, specializing in commercial, industrial, retail asphalt concrete repairs. Our staff has extensive experience in repairing parking lots of all types. It is important to us that we use the best materials and equipment out there, and we ensure the procedures we use current. We are fully licensed and bonded, and offer warranty and insurance on all services provided. Above all, we work hard to supply top-quality satisfaction and service. Find out more about Raleigh Triangle area parking lot services! To put it simply, Unlimited Professional Services is focused on excellence in the repair and care of concrete and asphalt. Our expertise in the Triangle region gives us a distinct advantage in the Triangle region and allows us to provide various associated services all while providing the highest standard of excellence accessible. With the demanding standards and specifications of the industry as it stands today, Unlimited Professional Services complies with the city and state regulations as needed to ensure the best outcomes for your own job. Our customers satisfaction is our primary concern. We’ll make sure your parking lot is in conformity with today’s local ADA codes. When your asphalt is properly maintained it will last for many years. We suggest that asphalt have a seal coating applies every two to four years and that pot holes and crevices be addressed early. 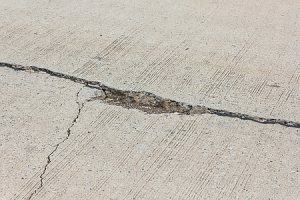 Over time, damage on asphalt or drive causes the decay of the binder that holds the components of the asphalt or cement together. Obviously, asphalt aging is unavoidable, however, it’s possible to slow it down and keep it strong through appropriate care of your parking lot or drive asphalt. Asphalt patching is the most common method of asphalt repair. This can be placed on any asphalt parking lot or surface. The process replaces particular regions of an asphalt pavement, usually those with potholes. This region represents the section of asphalt to be removed. To the underside and the sides of the hole, tack is used to ensure that the asphalt that is fresh sticks as needed. The hole is subsequently filled using hot or cold asphalt as determined by the season. Occasionally, we may need to replace the foundation stone underneath the asphalt pavement. Our professionals will analyze the subbase for any possible issues. They may have excessive wetness, general structural inefficiencies or problems, or a subbase that has been prepared in the first place. 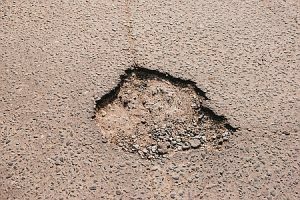 Such issues are generally not evident until the damaged asphalt is taken out, and must be corrected before replacing the asphalt. After fixing any issues with the substrate, it’s subsequently re-compacted and graded. Replacing can then begin. The borders of the region are cleaned and adhesive tack coating is subsequently applied to allow the fresh asphalt to be poured and adequately stick to the rock foundation. Ready for the full treatment? We’re ready to do a full parking lot powerwash for your parking area!